When he was a youngster, he was always looking for ways to earn money, so he could buy model airplane kits. He spent his leisure hours honing his skills with the various models he had purchased. He also wanted to learn to fly, and finally, the opportunity came when a local small airport manager in Conway, Pennsylvania, Joe Rabassi, offered he and his brother, Paul, a chance to earn some flying time by washing the small airplanes that were hangered at the airport. They earned a half-hour's flying time each week for their efforts. John continued working at the airport, his brother had lost interest; and started to learn to fly in various types of small airplanes; Piper Cubs, PT-19's and PT-26's, as well as other aircraft. John loved to fly low over his parents home and buzz them with the planes. They weren't too thrilled with his antics. John continued to fly and earned his student pilot's license at the age of 16, while attending Beaver high school. His first restored aircraft was a Fairchild PT-26 trainer that his dad co-signed for $1100. It was a 1959 model, almost like brand new. He then got drafted into the Army, spending his time at Fort Hood, TX. While in the service, John's mom sold the PT trainer for him. John then decided in 1963 that he wanted to leave the cold and humidity of Western Pennsylvania, so, along with his younger brother, Don, and Patty, Don's bride; drove to Southern California, where his older brother, Paul, had moved to the year before. John went to work at North American Rockwell, working in the printing plant. He continued his quest for different planes to own, accruing another PT-26. After restoring it, he flew this plane for several years, then sold it to Fred Sebby, of Huntington Beach. He used the funds to purchase a PT-17 Boeing Stearman biplane with another partner. He found a set of P-51 wings, badly damaged, in Texas. 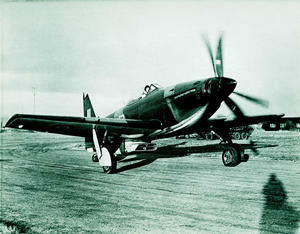 He brought them back to Chino airport and began the building of the MB5. With his brother Don, they cut and fitted all the tubing it took to build the fuselage, with a friend of his, Bill Youngblood doing the welding. It took 3 years to rebild the wings. He got married and decided to move to Reno with the plane loaded on a Semi flat-bed trailer. 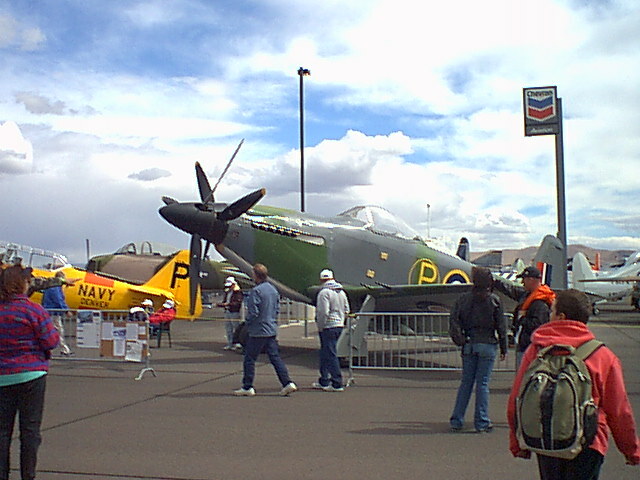 He had visited Reno during the races when he had his P-51 and liked the area. Along the way, the wings got damaged, which cost him more time to redo the work he had completed in Chino. He has been building the MB5, little by little at Stead NV., for the past 12 years. 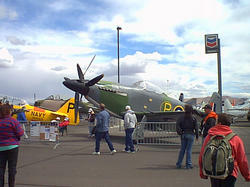 John has been invited for several years by Rolls-Royce, Ltd., to showcase his plane (photo right), at a static display, near the grandstands for fans to view.